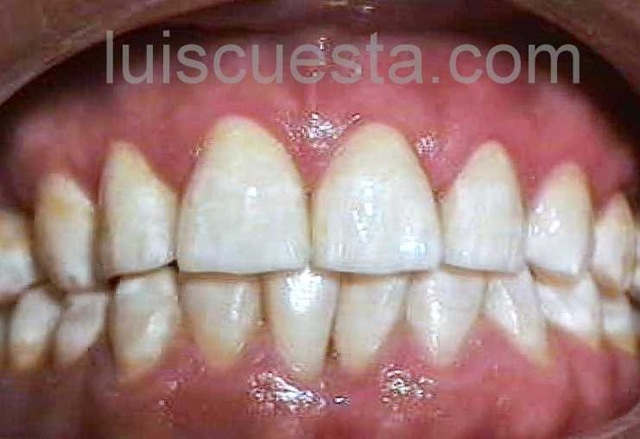 This case shows the procedure to make a smile make over with a combination of periodontal treatment and prosthetics. 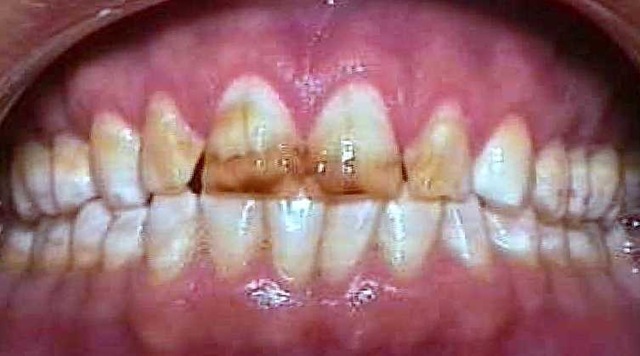 The patient arrives with moderate periodontal disease, lack of hygiene, severe stains due to excessive Fluor in the water he drank during childhood, and, of course, smoking. Exploration with probe shows bleeding and periodontal pockets over 3-4mm. 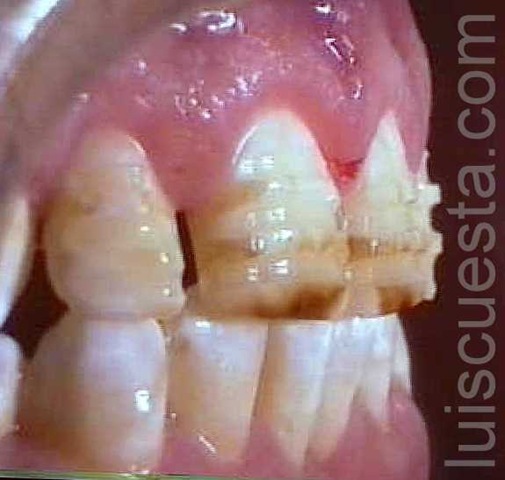 So, first, we clean the gums thoroughly and watch the evolution of new hygienic habits for several weeks. Teeth should be rather taller than wider, in a proportion of 2(width) to 3 (height). This case is the other way around. 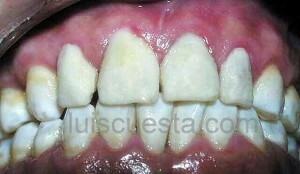 Then, I do a gingivoplasty. This is the surgical removal of gum tissue (gingiva), reshaping around teeth to a more proportional, healthy and esthetic shape. Now we have a healthier, more esthetic look, 2 by 3 in proportion, that even shows the effect of smoke. 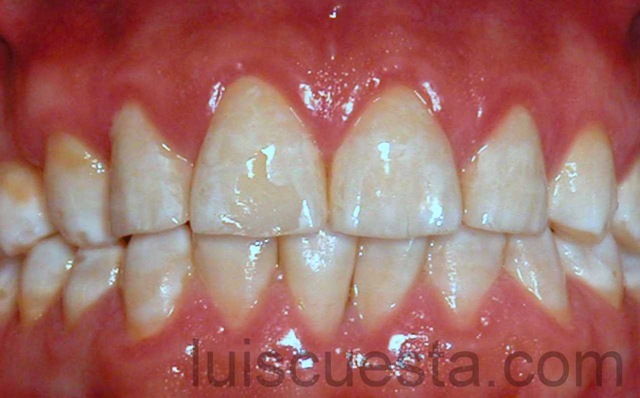 The light band of previously covered neck section of the teeth vs… the smoked front section. Stains cannot be removed by bleaching or whitening, since they are too dark and deep in the enamel. Plus, there are open spaces. So I proceed to carve to teeth with a controlled depth of 0.5mm on the front side, up to the gums. 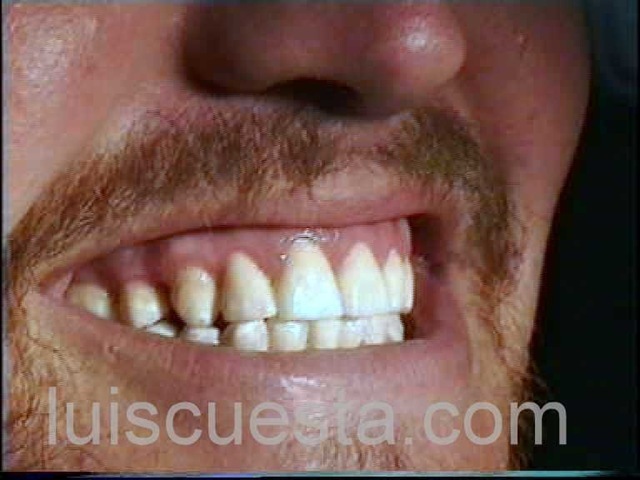 Then, I remove the incisal edge of the teeth to let space for the veneers that will fit on top. Otherwise they would be so thick that the bite would only touch on the veneers, breaking them. A set of two thin threads are placed in the gun pocket. 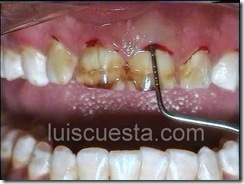 This phase would have been impossible to carry out without the convenient periodontal treatment explained before. 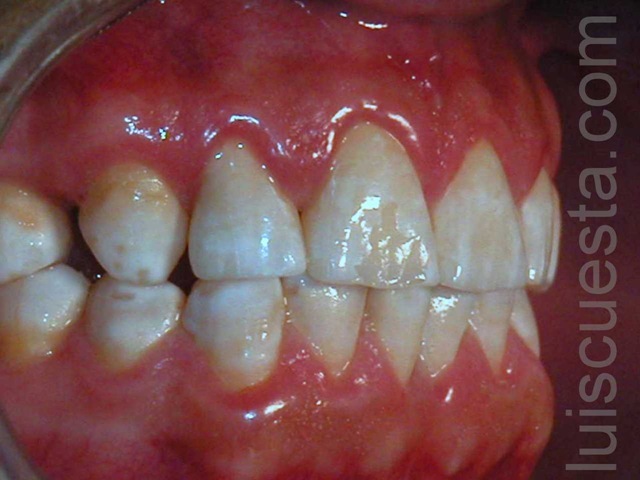 The ultimate purpose is to get a healthy gum tissue that doesn’t bleed when a silicon impression is taken. 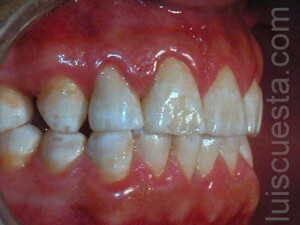 Bleeding gums provoke bubble distortions in the silicone impression, and an inaccurate cast. 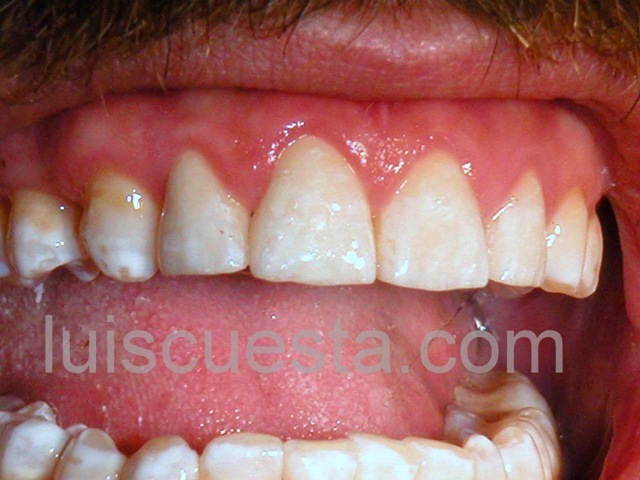 A precision cast is made out of the silicone impression. The cast is scanned by a in-office CAD-CAM system called Procera. 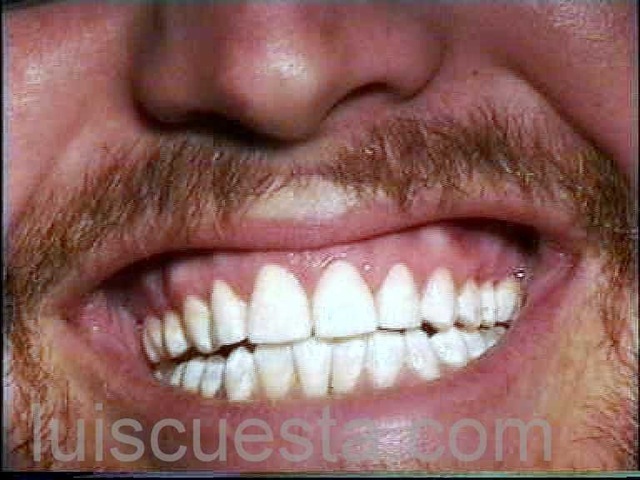 The scanned data are sent to the Procera headquarters in Sweden, where they make the inner part of the veneers. 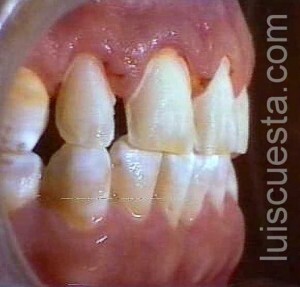 Temporary acrylic veneers are bonded while waiting for laboratory working times. 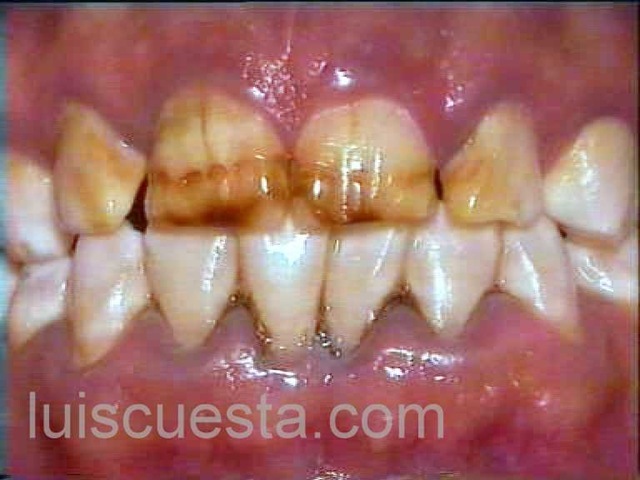 Several layers of ceramic colors are placed over the Procera nucleus to reach the final translucent color. 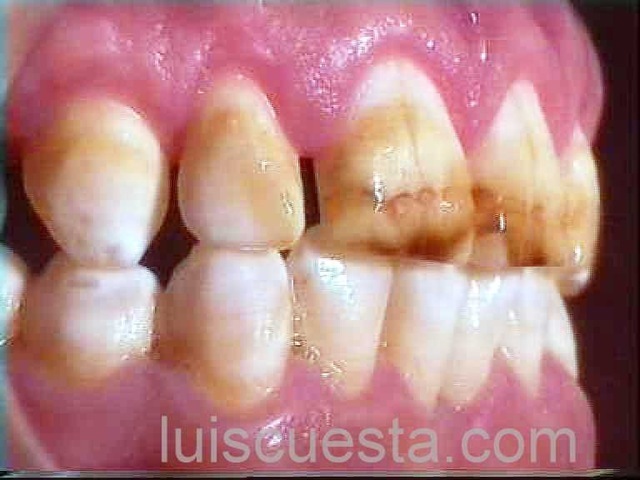 After we test a perfect adaptation and convenient color match, we bond the ceramic veneers. 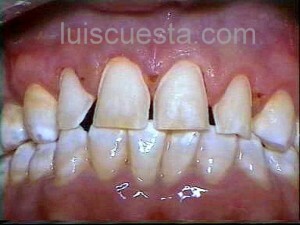 In this case we only substituted the four front teeth. 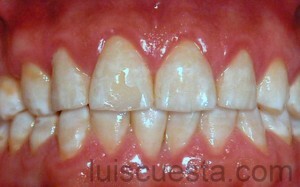 If the veneers had been more as to cover 6,8 or 10 teeth, the color could have been completely changed into a new one. But in this case we tried to camouflage the veneers with color and little white stains of the nearby teeth. Are they strong? Do they come off? 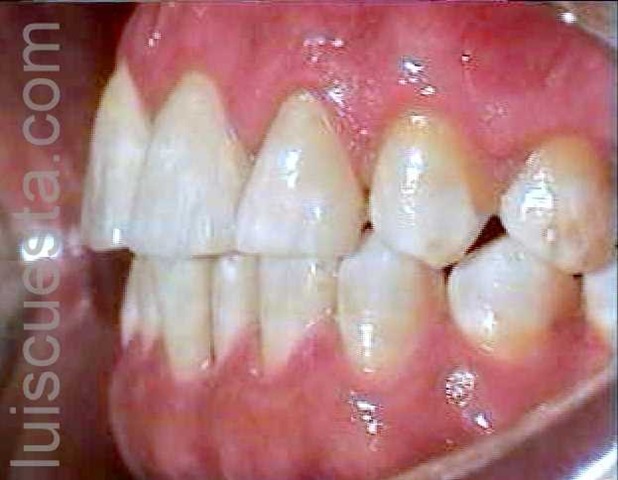 Three years after, the patient hit himself with the edge of the pool, and here is what happened. Only a slight ding on the color ceramic covering . No cracks in the under structure. 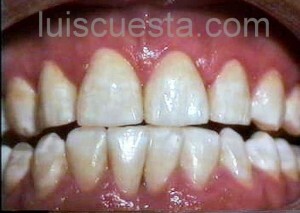 So I repaired it easily with a combination of composite resin colors, to match the ceramic. You can chew on these veneers as much as you can. They will not come off. 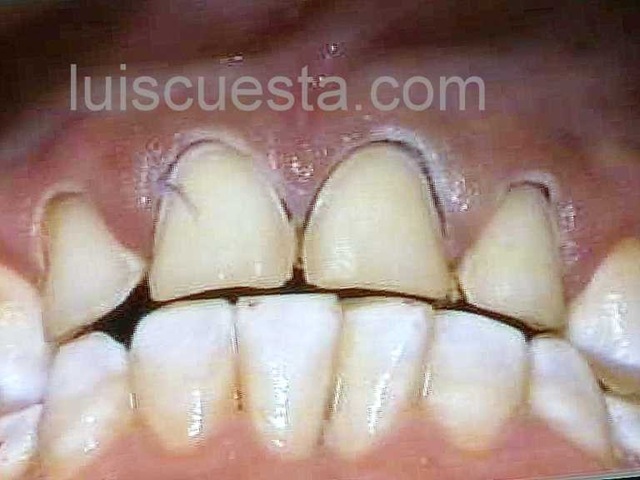 The bonding used is the same as for regular fillings, but the bonding force is huge thanks to the large area of bonding, compared to the reduce leverage. 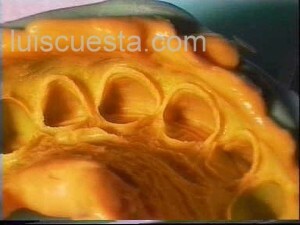 Risk of fracture is minimized by controlling the depth of the carving, and allowing enough thickness to the nucleus and cover not to break upon load.